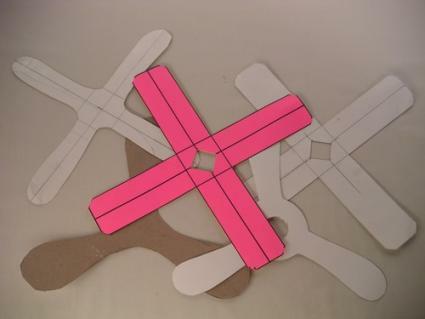 Cardboard boomerangs are one of the projects featured in Nelson’s book. Finding crafts for boys can be a challenge, but David Erik Nelson is here to help. As the author of Snip, Burn, Solder, Shred, he's come up with projects that are sure to appeal to even the most reluctant young crafter. Snip, Burn, Solder, Shred is not your typical craft book for children. There are no projects involving pom-poms, pipe cleaners, or glitter. What you will find, however, is an eclectic assortment of quirky playthings that includes projects like cardboard boomerangs and a muzzleloader that shoots marshmallows. These are projects that are sure to appeal to kids who wouldn't be entertained by more traditional crafting activities, especially active young boys who are more interested in video games and sporting events than spending the afternoon browsing through the aisles of Hobby Lobby. While the book's title brings to mind visions of power tools and complicated blueprints, you can still enjoy this book with your son even if you never set foot in high school shop class. Cardboard boomerangs, pop can flyers, and FedEx kites require no special tools or mechanical skills, and the other projects in the book are created with beginners in mind. If you need to learn the basics, however, you'll want to read the appendix on electronics components, tools, and skills first. Recently, author David Erik Nelson took the time to answer a few questions about making crafts for boys. LTK: The premise of Snip, Burn, Solder, Shred is a bit unusual. How did you get the idea for your book? DEN: Before my son was born, I taught and administered programs at a very small private alternative school. Because most of our students didn't do well in conventional learning environments and many were reluctant learners, we focused on project-oriented learning, both to teach practical skills like sewing or printmaking and standard classroom material like physics and geometry. Since this was a private school, we had a tight budget. The projects in Snip, Burn, Solder, Shred are an outgrowth of those classroom activities, which had to teach something useful while being fun and cheap. LTK: What project in the book is your favorite? Do your own children have a favorite project? DEN: My personal favorite is the $10 electric guitar. First, while most of these projects took a good bit of guess-and-check fine-tuning, the $10 electric guitar went from "I bet I could build this" idea to an actual instrument flawlessly. I was shocked at how smoothly the build went. Second, I just love playing it. I never learned to play an instrument as a kid as my mom had been emotionally scarred by having a piano teacher for a mother. I'm not much of a musician, but the $10 electric guitar is just so fun and easy. You pick it up and start strumming, and before you know it, you're making up songs. It's just a blast. My son is four, and he's most impressed by the Quick-n-Easy Water Rockets and cardboard boomerangs. He and his friends also love the instruments, especially the $10 electric guitar and thunderdrum. LTK: How old should children be in order to assist with the projects in this book? Are there any special safety tips parents should keep in mind? DEN: Although some of the projects, such as the sock squid and the PVC teepee, are ultimately meant to be enjoyed by kids as young as toddlers, the youngest kids I've done these with are middle schoolers. As for precautions, I've made a point of outlining those both in the book's intro and in the projects themselves. I urge makers to always keep in mind that real tools can really hurt you, but people of all ages and experience levels use them every day with comparatively few mortal incidents. LTK: What advice do you have for moms who want to tackle these crafts for boys? Is it really possible to make these items if you've never picked up a saw or a soldering iron? DEN: Absolutely! First off, many of these projects were designed for kid who had likewise never touched a saw or soldering iron; everything here is within your reach. Beyond that, I've found that, especially with teens, a little humility goes a long way. Some of my best teaching experiences weren't couched as "I know a lot about this, and now I'm gonna tell you," but instead as "I have no idea what I'm doing, but neither do you; let's figure it out together." Working together is really powerful, especially when the ages of the people working together diverge greatly. Visit the Snip, Burn, Solder, Shred blog. Follow the book on Twitter. 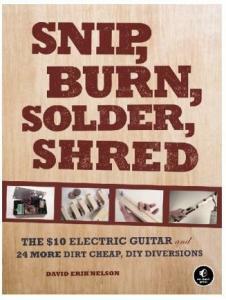 ~ A review copy of Snip, Burn, Solder, Shred was provided for this article.